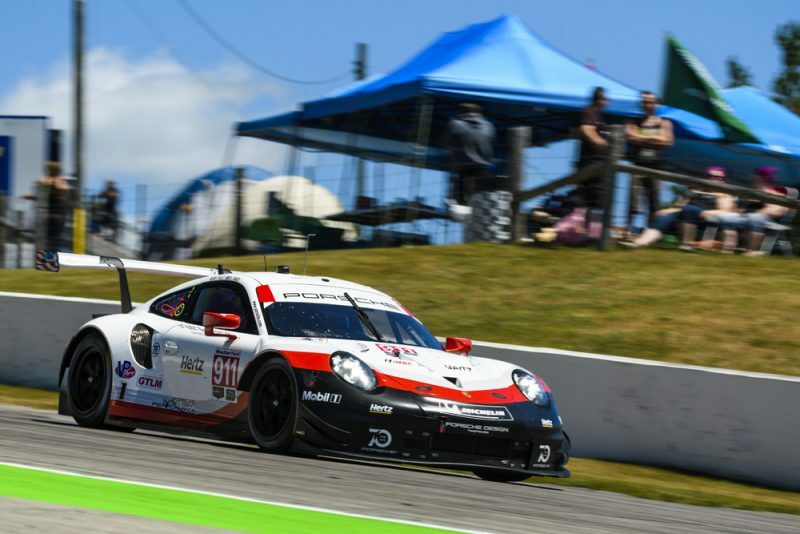 The Porsche GT Team tackles round seven of the IMSA SportsCar Championship at Lime Rock Park on 21 July with two 911 RSR. The Porsche customer team Wright Motorsports fields two 911 GT3 R racers. The race in the idyllic rural region of the US state of Connecticut, at which Porsche celebrated the historic maiden victory with the new 911 RSR last year, offers two unique features: at a length of just 2.414 kilometres, the course is the shortest on the championship calendar. Given that only the GTLM and GTD classes compete at Lime Rock, overall victory will definitely go to a GT car. With 18 victories, Porsche is the most successful manufacturer in the history of this race. Fans can look forward to a very special motorsport experience out in the countryside: Because there are no grandstands along the circuit, they can follow the action from the grassy hills surrounding the racetrack, equipped with camping chairs and cool boxes. In 2017, spectators were treated to a Porsche festival, with the 911 scoring victory in both the GTLM and the GTD classes. The narrow racetrack features six right-hand corners and just one left-hander. The cockpit of the #911 Porsche 911 RSR is shared by Patrick Pilet (France) and Nick Tandy (Great Britain). This season, the pair won the 12 Hours of Sebring. The Mid-Ohio winners Laurens Vanthoor (Belgium) and Earl Bamber (New Zealand) share driving duties in the second 911 RSR (#912) fielded by the Porsche GT Team in the GTLM class. In the GTD class, the Porsche customer team Wright Motorsports competes with two 911 GT3 R. Sharing driving duties in the #58 car are the works driver Patrick Long (USA) and Porsche Selected Driver Christina Nielsen (Denmark), with the #16 vehicle manned by Wolf Henzler (Germany) and Michael Schein (USA). For the second race season, the 911 RSR was optimised primarily in the setup. Depending on the size of the restrictor, the motor, which is positioned in front of the rear axle, puts out around 375 kW (510 hp). The particularly large rear diffuser combined with a top-mounted rear wing provide strong downforce and aerodynamic efficiency. The ca. 368kW (500 hp) 911 GT3 R was designed for worldwide GT3 series on the basis of the 911 GT3 RS production sports car. For 2018, Porsche provides its customer teams with an evo-kit.